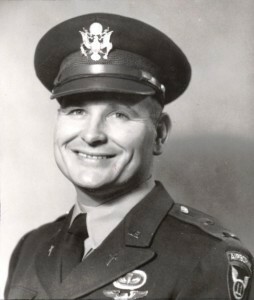 Hatch enlisted in the U.S. Army shortly after the Japanese attack on Pearl Harbor in 1941. He became an airplane mechanic, flight engineer, navigator, pilot, and finally a pilot instructor in the Army Air Corps, flying B-17s and B-29s. Following WW II, he attended Biola University and Talbot Seminary, while also serving pastorates at the Grace Brethren Churches of Long Beach and Seal Beach from 1948 to 1953. But in 1954, Burt began a tour of duty for God and Country as a Chaplain in the U.S. Army. From 1954 to 1958, he served with the 11th and 101st Airborne Divisions, receiving his Senior Parachute Wings. He served in the early 1960s with the Special Forces (Green Berets), which included “expeditionary” service to Laos in 1961. From 1962 to 1966 he was on the staff and faculty of the Army Chaplaincy School. During the Vietnam War, Burt served as a Division Chaplain (Americal Division), followed by assignments at Ft Leonard Wood and Fifth Army Headquarters, completing his career as a full Colonel and Senior Chaplain at Fort Rucker. For those wishing to send a sympathy card, Marie’s address is Roberta “Marie” Hatch, 1200 Mira Mar Avenue, Bedford, OR 97504. A slideshow from Burt’s memorial service is located on youtube at http://www.youtube.com/watch?v=KKv3eZLmQaE. I just did an internet search on Chaplain Hatch’s name..found this article, I served with him at Ft Rucker, as Senior NCO Chaplin's assistant; Prior to my deployment to Vietnam. Completely lost track of him. he was very kind and a pleasure to work for. I am sure those who knew him, enjoyed him and he will be missed.